Babotie is a surprisingly and elegant casserole that is so diffused in South Africa that it has become the country’s national dish. Traditionally, it would take 1 to 1 1/2 hours to prepare by baking in the oven. But you can have this dish ready in 30 minutes – including the grill finish.When writing a recipe that’s new to me too, like this South African dish, I read and research hundreds of recipes. Everyone seems to have their own, personalized version. So, to come up with my own I look for the common thread in all of the recipes to determine the base, and then garnish with a selection of ingredients that seem to go well together but would not be out of place in this region. Reading so many recipes, also helps me come up with suggested ingredient substitutions. Then, even if a pressure cooker version exists, I translate it to the pressure cooker myself from the original or base recipe to make sure that it’s as close to the original as possible (but faster). In the case of the South African Babotie, no pressure cooker version exists so I proudly present you another “first”! Serve with “Yellow Rice” which is a fluffy (white rice spiced with turmeric, sugar, cinnamon and raisins); and fresh slices of tropical fruit (mango, papaya, etc. ), a refreshing salad or a good helping of Chutney. I strongly encourage my South African readers to comment to share their Babotie version! Quantities for a 8 cup/2L/64oz, or 8.25 inch/21cm wide souffle' dish measure the dish and your pressure cooker carefully before making the dish. Tear the bread into medium chunks, and cover in milk, set aside. Put the dried fruit in a small bowl and pour boiling water over it to soak, set aside. In a large, wide, sautee pan over medium heat, add the oil and onions and sautee until the onions are soft. Add the curry powder, Turmeric, salt and pepper to taste, ground meat, break it up and cook it until it begins to turn golden and all of the liquid has evaporated (about 5-7 minutes). Turn off the heat, and mix in the sugar. Squeeze the bread and add it to the pan (keep the milk to use later for the topping). 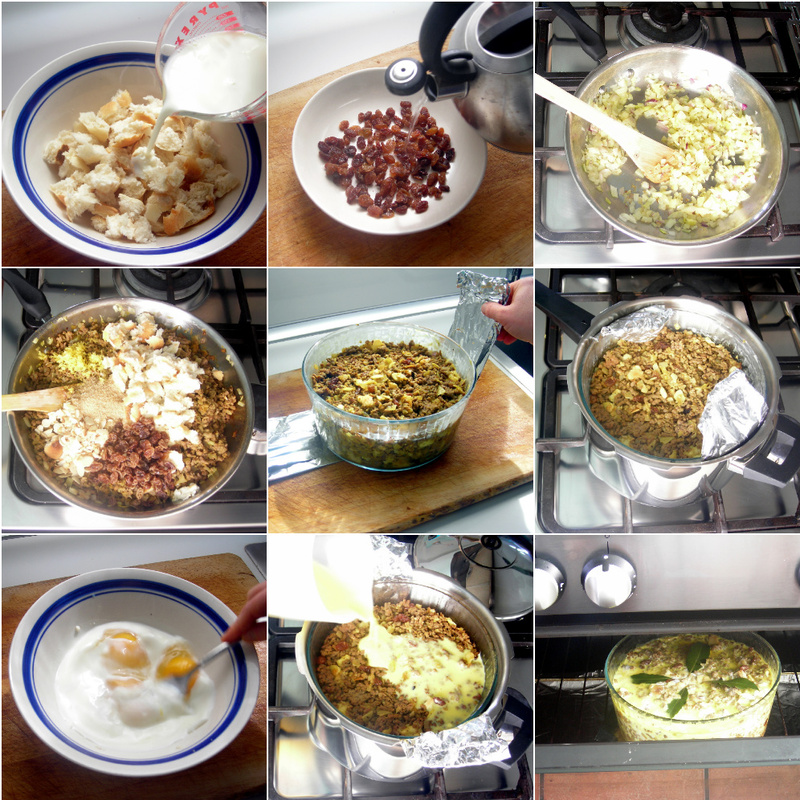 Then add the sugar, lemon juice and zest, almonds, and strained dried fruit. Mix well and pour into buttered baking dish. Push down lightly and flatten the meat mixture. Prepare the pressure cooker by filling it with one cup of water and the steamer basket. Construct a foil sling to lower the uncovered heat-proof dish into the pressure cooker - ensuring that the dish is centered and not touching the sides of the pressure cooker. Close and lock the lid, turn the heat to high. From the time the pan reaches pressure lower the heat and count 15 minutes cooking time at HIGH pressure. While the meat is cooking, prepare the custard topping. Mix the eggs into the milk. When the cooking time is up, open the pressure cooker by releasing pressure. Carefully remove the baking dish and pour the custard mixture over the meat, and add the Bay Leaves, and cover with tin foil. Lower in the pressure cooker again. Close and lock lid, pressure cook high for 3 minutes, and use the natural open. Serve as is, or brown the custard under the grill of your oven. Thanks so much for this recipe – who would have thought that I would be lucky enough to get a South African recipe on your blog – love baboti and the only difference (apart from the pressure cooker bit that is) is that I add mashed banana to mine. I will def. let you know the outcome!! Welcome Penny, and thanks for the excellent suggestion. Banana as an addition sounds delish! Ingenious! Love the recipe but love the method even more! You have a fan! Being from South African and knowing how good Bobotie is, I really liked this recipe and the fact that it could be made so quickly in the pressure cooker. It was easy to follow. Would tweek it a little to suite my taste better next time. I did love the hint of adding grated apple instead of raisins! My boys don’t like raisins and this way I could hide the fruit. I’ll add a little less lemon juice as this could be a little overpowering. But a great recipe all in all. Ansie, thank you so much for your message – it means alot to me that a South African enjoyed it!! Can’t wait to try this recipe myself, tried Bobotie a long time ago and loved it! Kelly, let us know if it tastes like you remember! Can this recipe be halved, and if so, how would that affect cooking time? This sounds amazing and I am going to attempt it today, for a South African friend recovering from surgery. Are there any tips you can give me when using an Instant Pot rather than a standard pressure cooker? Natalie, this is an older recipe that has not yet been updated to electric pressure cookers – you can do everything the same except for two things. The first thing is to add 1 1/2 cups of water in the base of the cooker for steaming, and the second is to pressure cook fro 20 instead of 15 minutes (for the first cooking). What a thoughtful friend you are! A million thanks! I’ll let you know how it goes!